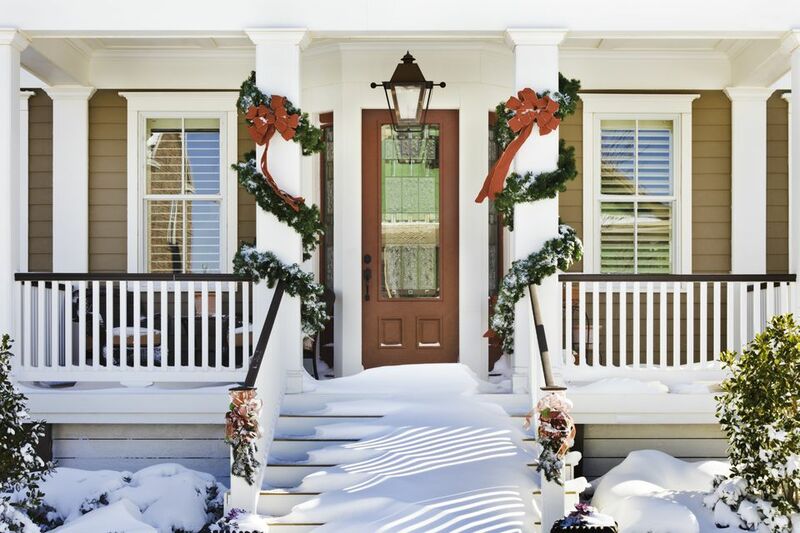 When the holidays come and the urge to decorate is heightened, a natural question to arise in the minds of homeowners is how to hang garland around a door (or on porch columns, etc.). Many evergreen materials are used for such decorations, including mountain laurel and balsam fir; artificial materials are also popular. But the key to success is in attaching them without damaging the house in any way. For example, maybe you were given some beautiful strands of natural, evergreen roping, replete with outdoor Christmas tree lights, shiny ornaments, or ribbons. You are looking for the best way to hang the garland around a front door or wind it around columns to decorate for Christmas, but you are stumped as to how to attach it safely. Many people shun ornamentation dripping with glitz and glitter in favor of outdoor Christmas decorations using greenery, which are more tasteful. Evergreen roping is restrained, but it can still bring a festive mood to your winter landscaping. If you wish to dress it up further while still staying natural, add cones to your roping, as you would when decorating a kissing ball. But the real challenge is in hanging it without causing property damage. When hanging garland around a doorframe, making it stick to a wooden column, or attaching it to the clapboard siding of a house wall, it is essential to do as little damage as possible to your structure. Holiday seasons come and go, but you have to live in this home after the decorations come down. Damage when hanging garland around a door is typically caused by hammering in nails, large staples, etc. This practice can easily leave you with split wood. Split wood allows moisture in, which results in rot. A better first step to take to hang a garland around a door or column is to pre-drill, making a pilot hole. You can then screw in screw-eyes or large ceiling hooks. In the case of columns, one screw-eye at the top and one at the bottom may be sufficient, since you have gravity working with you (wrap the garland tightly as you go, starting from the top and working your way down to the bottom, in a spiral). For a door frame, you will probably want to install more screw-eyes or ceiling hooks (it will depend, in part, on how heavy your Christmas garlands are). If you have downspouts, take advantage of them by tying the garland around them. If you will be using screw-eyes, then you will need pieces of wire, twist-ties, etc. to finish securing your garlands. Just thread a wire or a twist-tie through each screw-eye, then tie the wire around the Christmas garland. If you go the ceiling-hooks route, you can simply hang garland right over the hook part. There is less work involved this way. The trade-off, however, is that the garlands will not be quite as secure. To hang garlands from a column in this fashion, you will need several ceiling hooks, which means making more holes in your wood (something that is generally to be avoided if you can help it). Sometimes, you will need to attach the garland to a material other than wood. Decorating a house sided with vinyl is more challenging than decorating one sided with wooden shingles or clapboard. Ask for "vinyl siding hooks" at a home improvement store, and be sure that the package they come in explains how to use them. Failing that, buy suction cup hooks. Command hooks are less expensive; they adhere to a doorframe thanks to a sticky strip on their backs, which is exposed when you remove the liner. Metal garland hangers cost more, but they also offer a quality look that allows you to leave them in place even after you remove your garlands. They attach on the principle of spring-tension, so it's super easy both to install and to remove them. Some people use a staple gun to affix garlands to wood, using small staples. This practice is especially common along the handrails of extensive decks. It is a method that is feasible with certain kinds of garland, but not with others. You probably will not worry as much about causing harm when stapling to a deck railing, as opposed to your house, since such damage is easier to repair. If you do not want to chance damaging even a deck railing, simply wind the roping tightly around the handrail and tie it off at the ends as securely as you can. When garland has a horizontal structure, such as a rail, to support it, you can get away with having fewer attachments.